Hey there, I’m Ben, and I’m an artist with Wadjet Eye Games. I’m going to have a quick break from drawing pictures to talk about drawing pictures. “Storytelling” is much more than the plot of a game, and the words used to convey it. A game’s story is told in its writing, but also the acting that delivers it, the music, the way you interact with the game, and most importantly for my interests, the art. Imagery is an essential element in world building, the creation of atmosphere and the development of a story’s characters. Good art can not only support a game’s writing, but also allow it to come across more vividly, to bring the words to life. My initial motivations for learning to draw were quite simple – making things look good was cool and I wanted to be like the people who could do it. I viewed art entirely as a talent; not technical ability that one can learn and refine, not as a means of communicating an idea or message, but as some magical thing which let the lucky people draw well. I failed art in the 11th grade because of this misunderstanding – I wanted to learn how to draw just by drawing a lot, they wanted me to learn how to look at things and how to express myself. I was naive and impatient*. When I started drawing for games my approach was also very direct and basic. Certain adventure games look good, so I wanted to draw games that look like them. I had very little discipline and no real message I was trying to convey, or understanding of why those games look good, so I just muddled my way through, hoping for the best. Eventually there came a point where I could draw a little bit and I wanted to further my abilities, and I started thinking about why I was making certain choices and how they’d affect the games, analyzing why the images I liked appeal to me and what they bring to the games as a whole. I didn’t just want to make things look nice anymore – I wanted to tell a story. Working on Blackwell Epiphany with Dave was a great chance to explore this. I love working with Dave because – especially these days – he really focuses on the characters in a scene when he writes. I never get a sense of “We’re only going here because it’s a puzzle” when I read his scripts and play the games, he writes to tell us a story, let us explore the world. This is great for me because, although his sketches are very simple and he basically relies on the artist to add detail to a scene, I always know exactly what sort of mood a place has, what sort of atmosphere he wants for the story, and that gives my mind something to work from, a direction to focus on when I draw. This can affect things like colour choices, the brightness of a scene, the general composition and even what details make up the scene themselves. A wilted flower in a vase, a snowman that’s fallen out of shape, a dirty old mattress on the floor – these things all help convey little elements of a story to the player. I often think about building adventure game backgrounds as being similar to playing The Sims; these places have people living in them, and I furnish and embellish them in a manner that suits their personality and their story. Don’t just tell the player “this person is a slob” – make it completely apparent from their dwelling so the player knows that as soon as they walk in. That, for me, is the “why” behind art. I no longer approach drawing with the mindset of “I want to make a game that looks cool.” The art of a game is a means for delivering story, for creating a world. I’m no longer the 15 year old kid who wants to draw swords and robots just because they look cool to me; I want to help the writer tell their tale and, most of all, build worlds. I can do that with art, and that really excites me. I can’t discuss a story or game world with someone without my head being filled with visions of what would suit this, what I could do to help flesh out the world. It’s inspiring to have that sort of chance to create things. Of course, making things look nice is rewarding in its own sense. Being able to render an image accurately takes patience and skill, and can be very satisfying, but this ability to evoke emotions with my images is why I’m here. 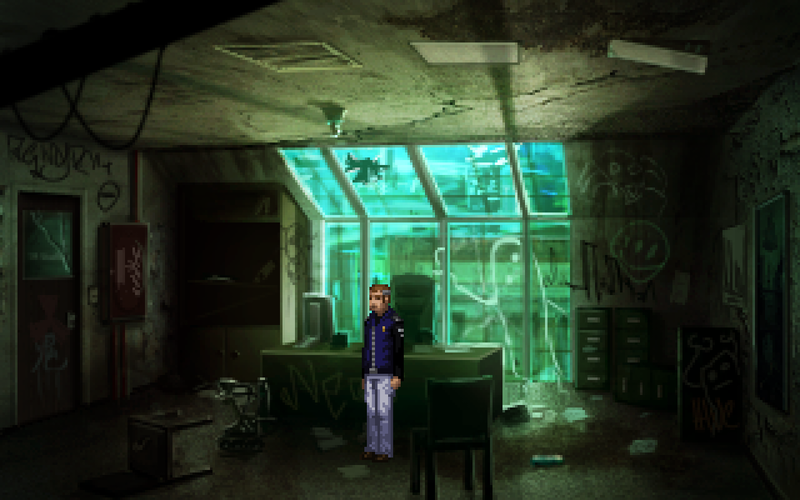 I’ve really enjoyed helping Dave and James to craft their worlds in Blackwell Epiphany and Technobabylon, and I look forward to showing you some of the world I’m currently building with Francisco on Shardlight. We have so many stories to tell. I look forward to having you along for the ride. Wonderful post, thank you for sharing. I’ve been following Ben’s games since his early AGS days! Your craft keeps evolving, and I thoroughly enjoy observing the new visual worlds you create. I was also stoked to see you collaborate with Wadget Eye. I hope you guys continue working together for many years to come. Been searching for Ben on the internet and must say, he’s a hard guy to track down. 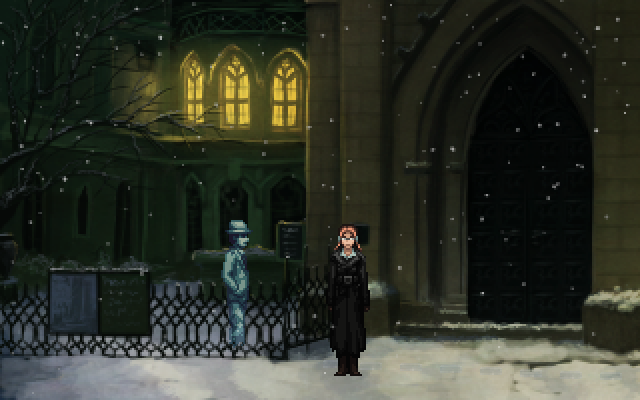 Just played the whole Blackwell series (for the second time cough* cough*) and I really like his style for the last game, especially the use of colored light in the scenes. Yum. I am currently playing the last game and thoroughly enjoying the commentary, but it leaves me wanting more info still. Would love to see how you create a background, especially low rez. I’m the biggest fan of oldschool 2d point and click, and this series hit the soft and fuzzy spot in my heart.